UR-210: humanized mechanism. Never has the clock did not show such devotion. Never has the clock did not show such devotion. Model URWERK UR-210 finally makes visible the special bond that comes between a man and his mechanical clock. UR-210 has an original and meaningful to URWERK way to display the time and proud of the opportunity to engage in dialogue with its owner. Even if this model and demonstrates cold chronometric precision in counting down the hours, UR-210 is still playing affective map, because it is a reflection of your pace of life: «UR-210 materializes symbiotic relationship between man and his watch. This humanized mechanism will tell you about yourself more than any other item in your possession, “- suggests Martin Fry. Dial UR-210 features a classic indication of the range in the “1:00”. At the opposite side of the dial, in the “11 o’clock”, there is almost the same indicator. Does this mean that the indication was doubled to double the controls? No, this device does not something small, it requires greater attention. Behind it is not seen each other before, for the first time demonstrated the development, determining the effectiveness of the mechanism of the plant in the last two hours of wearing UR-210. You comfortably curled up in your favorite chair and not moving? In this case, the mechanism of the plant is not sufficient, and the arrow pointer pridvinetsya inexorably to the red field. If you return to the duration of the activity, the index sets his sights on a green field – is a sign that you will again provide hours of required energy. In contrast, the indicator of torque, it is a whole new dimension is not determined by the winding tension springs, and “calculated” based on the ratio between the plant and the actual mechanism of energy expenditure. Now that this information has been provided to you, you can directly influence the situation. If your UR-210 indicate that the supply of energy is not enough, you need to set the control winding (located on the back side of the watch) to mark “full mode”. Then rotor converts any more or less hand movement into pure energy. When this setting is optimized winding mechanism through the turbine, which is connected with the inertial load and ensuring adequate and uninterrupted plant hours. Do you think that winding is too intensive and creates an unnecessary burden for the machine? Turn the adjuster wheel on the mark “light duty”, and turn the device to control the rotation of the rotor. Earn rubies mounted on the turbine blade, which – like the air compressor – will create resistance, friction of the air, enough to slow the automatic winding by the inertia load. In the “STOP” automatic winding device is disabled, and UR-210 converted to hours with a conventional manual winding. Let’s return to the front of the UR-210. Complication “Satellite” with retrograde minute hand of the model – both the original and absolutely revolutionary. 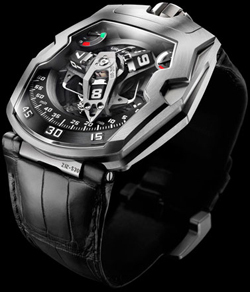 His “surprise” – the minute hand 3D custom proportions, represented as a high-tech fairing. Its function is to cover the entire block of time en route to minute scale. It is a journey through time for one hour, this slip for 60 minutes in an arc of 120 ° takes place smoothly and without a hitch. But the true essence of the details revealed after 59y minutes. Dry and distinct “click” marks the return of the unit to the starting point in less than 1/10 second, and coverage of the next time unit. The central axis ensures perfect stability mechanism. It installed on a ruby ground like a rock the whole structure rests complications. Walking along the coil spring, helical spring-like marine chronometer created the need for retrograde mechanism tension. Atypical minute hand – a real time fairing block – differs extraordinary dimensions. It is cut with ultra-high precision and admission to the hundredth of a millimeter. The total weight of the fairing made of metal, with the 0.302 ideal dimensions: width 8.03 mm x 22.29 mm length x height of 7.30 mm. He poured in aluminum, it provides impeccable balance brass counterweight. Dual coaxial cam in a star runs retrograde mechanism. His engagement, and then determine the trajectory of the rotation the minute hand. «UR-210 more than other models URWERK draws the eye. The attraction and wants to be called a hypnotic: the eye inevitably stops for energy meters. In fact, UR-210 is not a watch, but a living mechanism, transplanted to your wrist. We called each other UR-210 “Maltese Falcon”, because these watches embody something vague and abstract: they are made of the same stuff as dreams “- adds Martin Fry. «UR-210 – new for URWERK achievement. This model opens the next chapter in the history of our developed complications. It is no longer only on the measurement of the universal values of previously unknown way, but the establishment of a genuine dialogue between the hours of their owner. UR-210 reflects the personal sense of proportion – your and no one else “- concludes Felix Baumgartner.